What makes this a plate of something other than sausage and beans on toast with a fried egg? 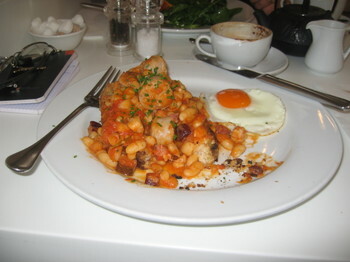 The fact that it was served in a cafe in Upper Street, of course, which means it is called something like "a fandango of hand-carved haricots rouge served in a flaked pork cassoulet on a bed of our home-baked, stone-ground bread. Er, with an egg." It cost £8.50 but, as it happens, it was money well spent. That's because it was someone else's money.